The word fossil comes from the Latin word ‘fossilis’ meaning ‘dug up’. People who go fossil hunting are looking for something that they can literally dig out of the ground and take home! In the early days of geological science, in the late 18th century, an English mining engineer called William Smith dug up the fossils he found whilst digging canals, and took them home just like modern-day collectors. He also took careful notes of where each specimen came from and noticed that there was a pattern in the way certain fossils appeared in the rocks. Different forms of ammonites always appeared in layers of rocks in the same order from the lower layers to the top, even though the rocks might be very different, and be at great distances from each other. He realized the significance of this and developed the ‘principle of faunal succession’. This was the first time that fossils could be used to date rocks and compare the ages of rock from different places! It seems that everyone is fascinated by fossils. They make a link between us and the deep past in a way that other inanimate objects and materials just don’t do. But most people only see fossils in isolated beauty in museums or photographs, and don’t make a link with the rock in which they have been entombed for so long, and this is a shame because fossils are intimately linked to their stony prison. So what is stone for? You can build a wall with it, use it as stepping stones to get from one side of a stream to another, pile it up against a shoreline to protect it from the battering waves (this is called rip-rap) or, more likely if you are near the sea, throw it into the water to hear the satisfying splash and watch the ripples propagating ever more gently outwards, like the sun’s rays as they disappear into space. But rocks are so much more than this because if you are prepared to look more carefully, every piece tells a long and convoluted story, covering millions of years of searing heat and huge pressures, chemical stews, explosions, baking sunshine, bitter cold glaciations, raging rivers, swirling beaches and deep ocean basins. Each environment leaves its mark on the final product (the rock) and one piece of evidence for this history is the fossil assemblage within it. Now you may think that fossils are very rare but you would be wrong! You have probably had millions of them in your hand at some time in your life without even realizing it! Most fossils aren’t huge, ugly (I know many would disagree with this!) flesh-eating monsters of the Jurassic and Cretaceous period. These big fossils are rare, but most fossils are microscopically small and very abundant. In comparison, foraminifera are quite big at 250 microns (a quarter of a mm) and they can be found in chalk, mudstones and sandstones. Their forms are equally beautiful and extremely varied, uniquely designed for either floating on the top or lying at the bottom of the oceans. There are thousands of forms that have evolved over time, and sometimes become extinct, printing out a pattern of change that geologists can use as a clock to find out the age of the rocks in which they are found. On board Expedition 350 we have a team of micropalaeontologists looking for foraminifera and coccoliths. They are the first people to get samples of the rock when it comes up and their main job is to determine the age of the rocks as we drill down into deeper and older environments. 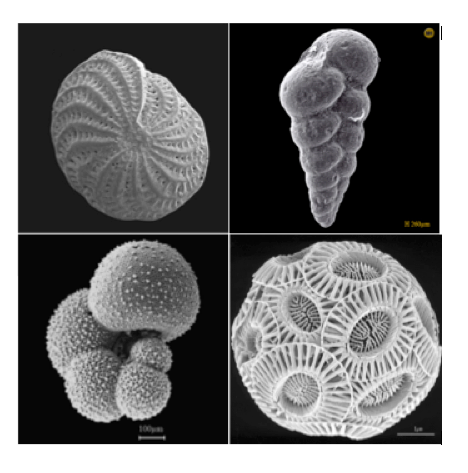 Apart from coccoliths and foraminifera, there are many other forms of microfossils, for example diatoms and radiolaria with their tantalizingly intricate skeletons made from minute threads of pure silica, or the organic remains of pollen and spores – each one identifiable to its parent plant so it provides a detailed picture of environments in the geological past. It is worth searching on the internet for micrographs of microfossils, and once you have seen them in detail, you will find them every bit as fascinating and interesting as T Rex!